Policy makers in many countries are debating whether it is worthwhile to open their National LiDAR holdings – collected with tax-payer money – for free (or cheap) open access or whether they should continue to restrict access and charge potential users of the data to recoup expenses. Most would agree that hurdle-free, instant online access allows to exploit this valuable resource to the fullest and to maximize its benefit to the citizens. But some argue that opening this data eliminates the revenue stream the government needs to finance future surveys. Is this really true? No! On November 21st, 2014 Louise Huby made this “Freedom of Information” request to the Environment Agency which are responsible for collecting, processing, and selling LiDAR data and derivatives for England with a focus on flood mapping applications. This seems to mainly be handled by the Environment Agency Geomatics, a specialist business unit within the Environment Agency. all revenue made from the sale of LiDAR Data? of all revenue made from the sale of LiDAR Data? 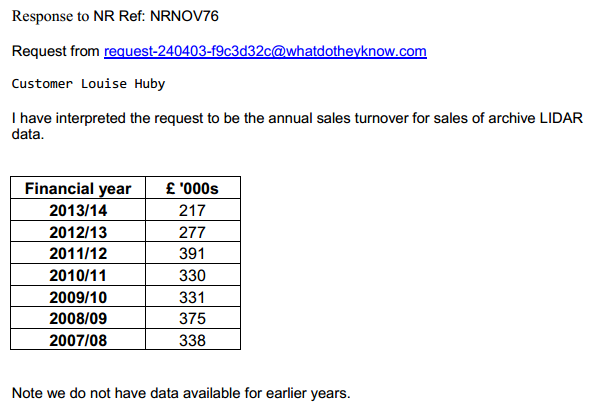 Hence the annual sales turnover (*) for LiDAR data was around £323,000 per year between 2007 and 2014. It would be interesting to know how the annual average of £323,000 divides up further in terms of delivered products (raw LiDAR points or derivative), individual sale volume, price per square kilometer, type of customer, … Another request anyone? (*) Sales turnover is the total amount of revenue generated during the calculation period. The revenue included in this calculation is from both cash sales and credit sales. According to Wikipedia, the Environment Agency had an operational budget of £1,025,000,000 in 2007/08 (about half of this for flood risk management). This means the renevue from LiDAR sales is equivalent to 0.03 percent of the Agencies’s operating budget. I find this number shockingly low. Is this meager sales revenue an acceptable reason to keep the LiDAR locked up and inaccessible to the public? The main customer of LiDAR are the many branches of government from municipalities to federal agencies who often did not use it before, because it was “too difficult to obtain”. If someone needed geospatial data to make a decision but first had to fill out lots of paperwork and justification forms, possibly find a budget, and wait weeks for the delivery, then many questions had become irrelevant by the time the data arrived and decision were made without or with less good data. Open LiDAR brings a bigger “return of investment” because the data – whose value is highly inflationary – gets used immediately for all purposes and not only when the anticipated potential of exploiting it sufficiently outweighs the upfront investment in time and money for aquiring it. New business cases become worthwhile for which the LiDAR becomes “raw material” used to create new products and provide new services. This creates additional high-tech companies that pay taxes and desirable high-skilled jobs that would otherwise not exist. This can only happen if the resource “LiDAR” is either free or very cheap. It benefits both government and citizens as additional services and products are becoming available. Overall: faster, better, cheaper service for all, full exploitation of the available resource, and higher return (even financially) in the long run. One of the biggest drawbacks of trying to monetize the LiDAR is not only that there will be fewer services and products created by private sector businesses … but they will also be much more expensive. Those companies that took the risk to buy the data in the first place will charge a high premium on their services and products. And their biggest customer will be the government. Hence, an initial sale (quick money) will lead to years of high expenses for the government when it has to buy back the derived data products and services … costing many times more than was earned in the initial data sales. This article originally appears on rapidlasso.com, posted last 30 November 2014 and reprinted with the permission of the author.